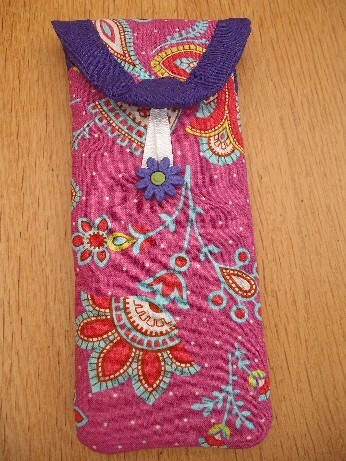 It has been a very busy week for me – work wise, family wise and crafting wise. We have got a lot done this week – am spending most of the next couple of weeks at work finishing off the marking and admin for this year’s group of students and starting the planning for next year so we shall be busy before we go away on holiday. Jake has been very busy with his assignments as he finishes college next week – he has been doing some very impressive 3D modelling as part of his Games Design course. We went to Teeside University Open Day this week to look at a Games Design degree for him and this week are going to Newcastle for their Open Day – all very exciting stuff! 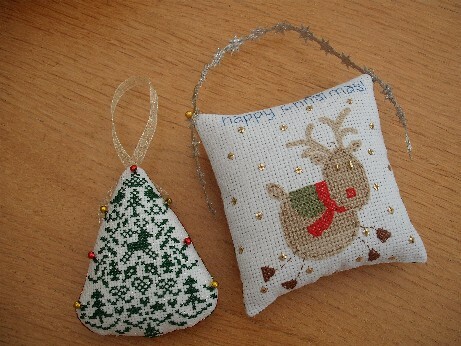 Ellie and I have been doing lots of crafting – she has been doing it all week (lucky thing!) but I have only been doing bits evenings and weekends but we have both had a very productive weekend. This is what Ellie finished off this week. The cat is a present for one of the family babies and the bags are for friends of hers, aren’t they lovely – especially the glasses case in the last picture. 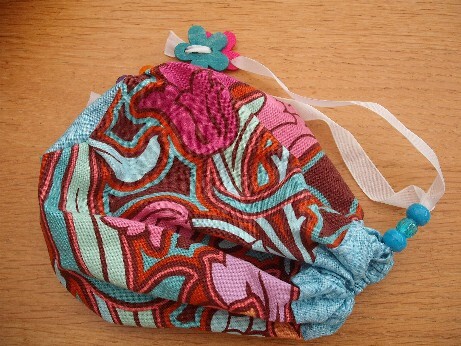 The pattern ideas all come from the Cath Kidston Sew book I bought her for her birthday but she has adapted most of them. 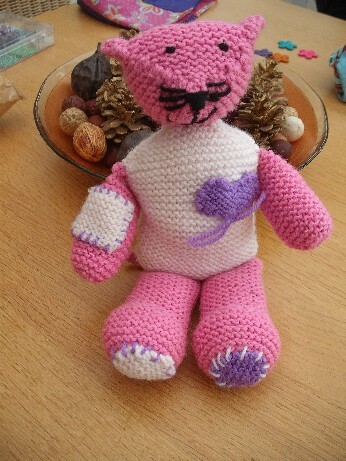 She is now working on a pile of very cute pincushions from the same book – pics to follow! I have been mainly finishing and making Xmas ornies this week – hence the title of this post though it has not been very summery weather until today when it was scorching hot so it did seem a little strange in my very warm conservatory with all the doors open putting together Christmas fabric. 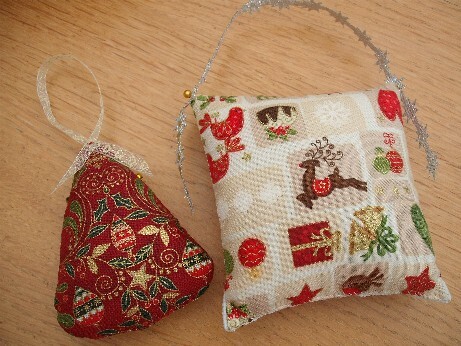 The first two pics are stitching finishes – one of the latest in my JBW ornie series with a cute little tree and the other reindeer ornie was a cross stitch mag freebie that Ellie stitched a while ago that I have turned into an ornie. Both of the backing fabrics for the above ornies were purchases from the recent Malvern Quilt Show and are from Makower’s current Xmas fabric range – I am very pleased with the way that the reindeer ornie matches the backing fabric – as if they had been made for each other! I have started working on my stock for Xmas craft fairs this year – using the same ideas as I did for all the little patchwork trees last year. This time I am doing some hanging ornies. I have used the same technique of a backing fabric with Bondaweb ironed on and then lots of fabric scraps crazy patchworked on. I have then zig zag stitched all the joins then I cut out the shapes. I have done a set of hearts this weekend and I think that they look very cute when finished with one of my little brass charms. 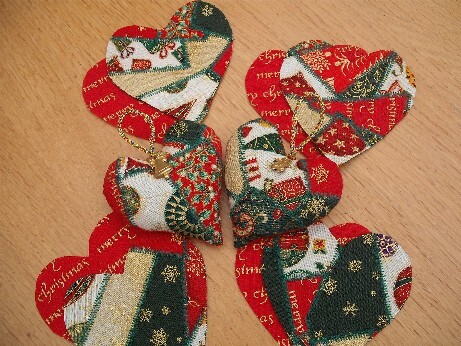 The pics below show the cut outs with the ‘Merry Christmas’ backing fabric I have used with a couple of finished hearts and a close up of one of the hearts. Well it is late now and I have a busy week ahead so will have to say bye for now – thanks as always for visiting and have a lovely week! Looks like you two have been busy and having fun. That little kitty is adorable! 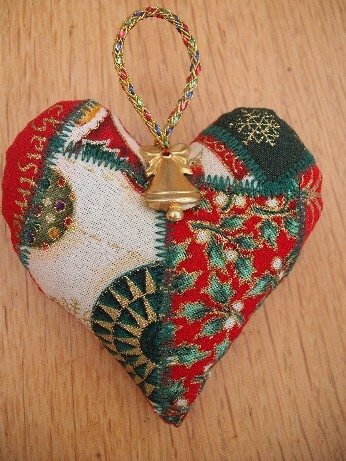 I adore the little Christmas patchwork hearts Alison.